Microalgae are key test organisms to assess the effects of chemicals on aquatic ecosystems. Zinc oxide nanoparticles (ZnO NPs) as a widely used metal oxide is considered a potential threat to these primary producers at the base of the food chain. This study investigates the toxicity of ZnO NPs, bulk ZnO, and Zn2+ to the representative of freshwater microalgae, Raphidocelis subcapitata. To examine the effect of shape and size of nanoparticles, two types of spherical ZnO NPs with different sizes (20 and 40 nm) and two types of rod-shaped ZnO NPs with different lengths (100 and 500 nm) were synthesized. 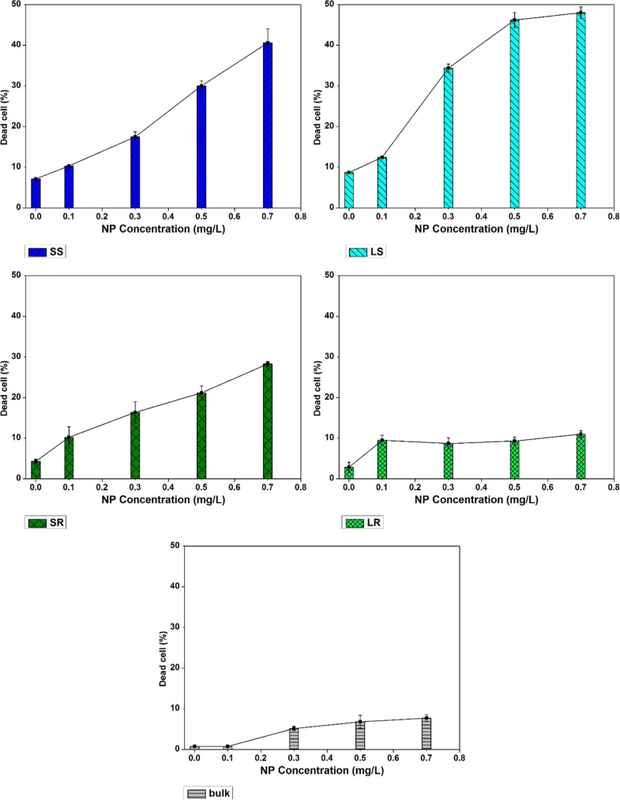 Microalgal cells were exposed to eight concentrations of each ZnO NP type from 0.01 to 0.7 mg/L for 96 h. The results showed that 0.7 mg/L of ZnO NP could completely inhibit algal growth. Size did not interfere with toxicity in spherical ZnO NPs, but the toxicity decreased by increasing the size of rod-shaped ZnO NPs. 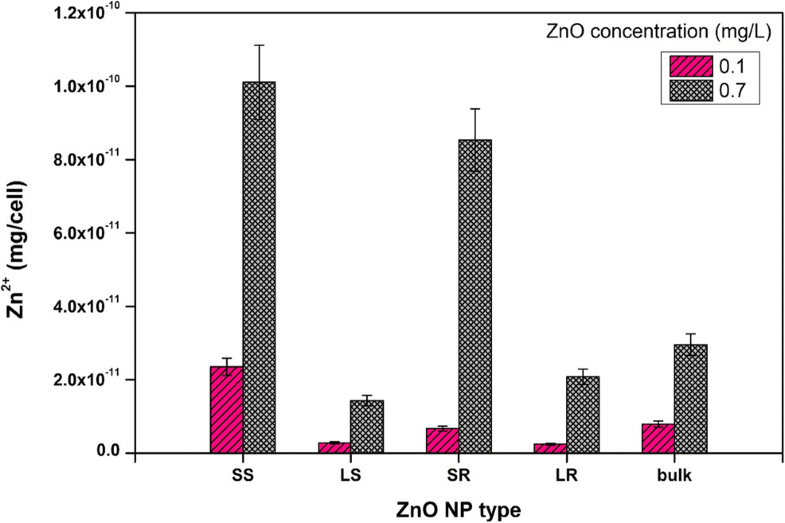 Spherical ZnO NPs acted more destructive to microalgal cells than nanorod shape. The addition of 0.7 mg/L of ZnO nanorods to samples caused 30% cell death, while 50% cell death was observed by adding the same concentration of nanospherical ZnO. Nano ZnO revealed to be more toxic than bulk ZnO and Zn2+. The Zn2+ released from dissolution of ZnO NPs was one of the sources of toxicity, but the ZnO nanostructures were also an important factor in the toxicity. The online version of this article ( https://doi.org/10.1007/s11356-018-3787-z) contains supplementary material, which is available to authorized users. Metal oxide nanoparticles are currently applied in many commercial products and an increasing trend is expected for their usage and mass production in the future (Liu et al. 2018). This expanding usage of nanoparticles results in their higher release and accumulation in the environment which introduces new risks of toxicity to ecosystems (Luo et al. 2018). Therefore, the new hazards that might appear with nanotechnology should be considered by constant risk assessments (Nowack and Bucheli 2007; Schiavo et al. 2018). The toxicological properties of nanoparticles are affected by their physicochemical characteristics including the size and morphology (Hsiao and Huang 2011). Despite the huge studies in this field, no consensus is achieved about the role of size and morphology of nanoparticles in their aquatic toxicity (Xiang et al. 2015). Reaching to a nanostructure which exhibits lower toxicity, is a great help to design nanoparticles with less harmful effects to the environment. The toxicity of metal oxide nanoparticles have been widely investigated on a broad range of organisms (Hou et al. 2017; Manzo et al. 2015), but comparative studies show that ZnO nanoparticles in general are more toxic than other metal oxide nanoparticles such as TiO2 and CuO (Aruoja et al. 2009; Bondarenko et al. 2016; Ivask et al. 2014; Juganson et al. 2015; Raghupathi et al. 2011). ZnO as a widely used metal oxide is currently found in diverse products in forms of plastics, ceramics, glass, cement, rubber, paints, batteries, pharmaceuticals, and personal care products such as cosmetics and sunscreens (Ghaffari et al. 2017; Hou et al. 2018b). The release of ZnO nanoparticles from these products into aquatic environment is an emerging concern, while their fate in aqueous systems is still unclear (Blinova et al. 2010; Oukarroum et al. 2012). 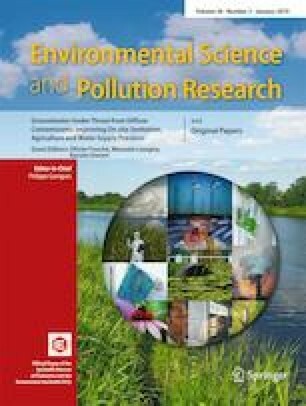 Algae are key organisms in aquatic toxicology studies as primary producers in aquatic environments (Hajimahmoodi et al. 2010; Machado and Soares 2015). Toxicity studies on algae report them more sensitive to ZnO nanoparticles compared with organisms like bacteria, yeast, crustaceans, fish, and mammalian cells (Bondarenko et al. 2013; Bondarenko et al. 2016; Juganson et al. 2015). According to FDA, ZnO is generally recognized as safe (GRAS); however, zinc has been shown toxic to different marine algae (Manzo et al. 2013; Miao et al. 2010; Miller et al. 2010; Wong et al. 2010) and freshwater algae (Zhou et al. 2014) at concentrations much lower than 1 mg/L, and algal death can affect the whole ecosystem in long term (Bondarenko et al. 2013; Lee and An 2013). The freshwater green alga Raphidocelis subcapitata (also known as Pseudokirchneriella subcapitata and Selenastrum capricornutum) is a chlorophyll-containing eukaryotic cell belonging to the Chlorophyceae class, with crescent shape, unicellular, non-motile, and non-polymorphic. R. subcapitata represents both eutrophic and oligotrophic freshwater environments; its cells do not show tendency to aggregation and so the enumeration is not challenging and has proved to be sensitive towards various hazardous substances. Therefore, it is one of the recommended species for algal toxicity tests (Blaise and Férard 2005; Debenest et al. 2011). The aim of this work was to study the impact of morphology and size of ZnO nanostructures on their toxicity towards R. subcapitata as the representative test organism of freshwater algae. Accordingly, algal cells were exposed to synthesized ZnO NPs with distinctive sizes and shapes, and growth inhibition and cell death were measured as toxicity responses. The toxicity of bulk ZnO was also investigated. Dissolution of ZnO structures was measured and toxicity of Zn2+ to algae was examined to determine the role of dissolved Zn in the toxicity of ZnO NPs. 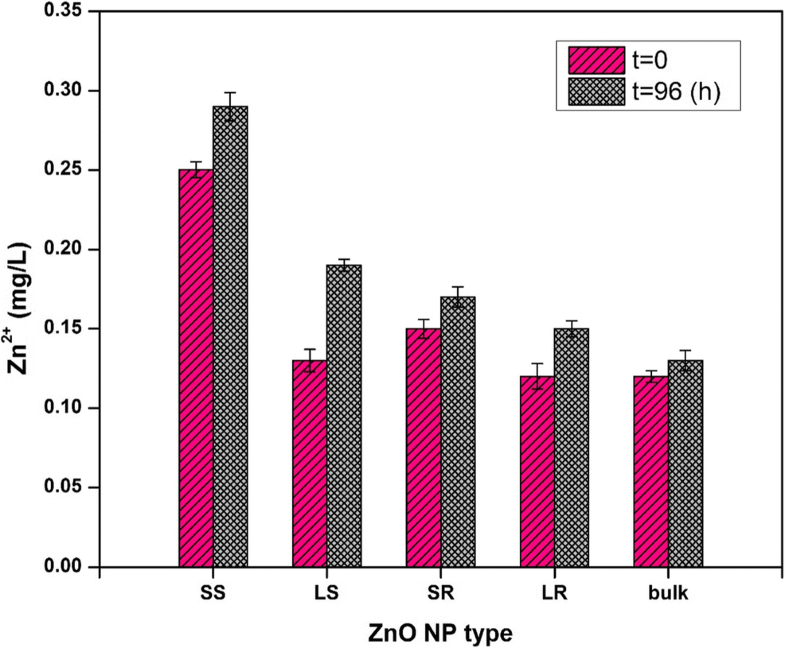 Four types of ZnO NPs and a form of bulk ZnO (> 100 nm) were used. Two spherical and two rod-shaped ZnO NPs and spherical bulk ZnO were synthesized by simple precipitation methods as follows. Bulk ZnO was formed by adding 50 mL of 1 M MgO solution in distilled water to 50 mL of 1 M ZnCl2 in distilled water. pH was adjusted to 13 by addition of aqueous 2 M NaOH solution and the solution was refluxed at 90 °C for 1 h. To form small sphere (SS) ZnO NPs, 50 mL of 0.5 M ZnCl2 (in ethylene glycol) was added dropwise to 50 mL 0.5 M Ca(OH)2 (in ethylene glycol) under stirring condition. pH was adjusted to 13 by addition of aqueous 2 M NaOH solution drop by drop. The solution was refluxed at 110 °C for 2 h. In forming large sphere (LS) ZnO NPs, 10 mL triethanolamine (TEA) was added to 50 mL 0.5 M Ca(OH)2 in water-ethanol (1:1). Subsequently 50 mL of 0.5 M ZnCl2 in water-ethanol (1:1) was added dropwise to the solution. pH was adjusted to 13 by aqueous NaOH solution. The solution was then refluxed at 80 °C for 1 h. To synthesize small rod (SR) ZnO NPs, 9.11 g (0.4 M) cetyl trimethylammonium bromide (CTAB) was added to 50 mL 4 M Na(OH) in water-ethanol (1:1). After stirring for 15 min, 50 mL of 0.5 M ZnSO4 in water-ethanol (1:1) was added dropwise to this solution and pH reached to 13 by NaOH aqueous solution. The solution was refluxed at 90 °C for 2 h. Large rod (LR) ZnO NPs were synthesized by dropwise addition of 50 mL of 0.5 M Ca(OH)2 in distilled water to 50 mL 0.5 M ZnCl2 in distilled water. pH was adjusted to 13 by adding 2 M aqueous NaOH. The solution was refluxed at 85 °C for 1 h. For all samples, the white obtained ZnO powder was collected after centrifugation, washed with distilled water, and ultimately oven dried at 70 °C for 20 h.
R. subcapitata cells received from the culture collection of algae of Göttingen University (SAG) were cultured immediately in the medium suggested by the provider. These cells were used as inoculant to prepare a stock of R. subcupitata cells in AAP medium (“Algal Assay Procedure” medium, as described by Miller et al. (1978)). Algal cells were maintained in sterilized AAP medium and incubated at 24 °C under continuous white fluorescent light (50 μmol/m2/s). The cell number was measured daily using a Neubauer hemocytometer to obtain the growth curve of R. subcapitata in AAP medium. ZnO powder was suspended in culture medium (AAP). One milligrams of ZnO NPs was dispersed in 200 mL of medium using probe ultrasonicator (UH_500B ultrasonic processor, 50 kHz) for 10 min. The suspension with no visible sediment of nanoparticles was autoclaved for 15 min at 121 °C. The necessary amount of this suspension was added to the test vessels to make the desired concentration of ZnO nanoparticles in the test, ranging from 0.01 to 0.7 mg/L. Organization for Economic Cooperation and Development (OECD) guidelines were used to conduct the toxicity tests (OECD 2006). According to the growth curve obtained for R. subcapitata cells, 3–7-day-old algal cells were used as inoculant to ensure the logarithmic growth of cells during the test period. An initial cell count of 104–105 cell/mL was equally prepared from the same inoculum in 250-mL flasks containing 50 mL of test medium. Test medium was AAP plus different amounts of NP suspension, based on the desired NP concentration. Nine different concentrations of bulk ZnO and ZnO NPs (0.01, 0.03, 0.05, 0.07, 0.1, 0.3, 0.5, and 0.7 mg/L) and a blank test with no amounts of ZnO NPs were used, in triplicates. Toxicity test with ZnSO4 salt was also performed at concentrations of 0.05, 0.1, 0.2, 0.3, 0.4, 0.5, and 0.6 mg/L to find out the role of dissolved ZnO in the observed toxicity. The vessels were incubated for 4 days at 24 °C and shaken continuously at 100 rpm under continuous fluorescent illumination (50 μmol/m2/s). Algal cell number was measured every 24 h using a Neubauer hemocytometer. Different techniques were used to characterize the synthesized ZnO NPs. The crystallinity and phase purity were evaluated using an X-ray diffractometer (XRD; Bruker D8 Advance and Siemens D-500). Morphological observations and primary particle size were assessed using scanning electron microscopy (FESEM, Hitachi S-4160). The hydrodynamic diameters of ZnO NPs were measured by dynamic light scattering method using the Nano ZS Malvern Instruments. The nanoparticles were dispersed in the culture medium by sonication (50 kHz, 10 min; UH_500B ultrasonic processor) before analysis. The dissolution of ZnO nanoparticles in alga-free AAP medium was measured at the beginning (t = 0, which means 2 h after the preparation of NP suspension) and end (t = 96 h) of test duration to determine whether Zn2+ ions play a role in ZnO toxicity. Suspensions of all types of ZnO particles were prepared (as described in the “Preparation of nanoparticle suspension for toxicity tests” section) at the highest concentration used in toxicity tests (0.7 mg/L). The samples were kept in conditions similar to those in toxicity tests (24 °C; continuous shaking at 100 rpm and under continuous fluorescent illumination of 50 μmol/m2/s). At t = 0 and t = 96 h, the samples were centrifuged at 16,500g for 20 min and the concentration of Zn2+ ions in the supernatant was measured by atomic absorption spectrometer (AAS) (Li et al. 2016; Suman et al. 2015). Transmission electron microscopy (TEM) measurement was conducted to examine the morphology of algal cells exposed to ZnO NPs. The culture treated with SS ZnO NPs was centrifuged and collected algal cells were fixed in glutaraldehyde at 4 °C for 1.5 h. After rinsing the sample with phosphate-buffered solution (PBS), it was post-fixed in osmium tetroxide for 1 h at room temperature. Then it was rinsed with PBS, and was dehydrated in graded series of ethanol (25–100%). Infiltration and embedding was done in graded resin, and curing of sample was then performed in oven for 72 h at 60 °C. The cells were cut into ultra-thin sections using an ultramicrotome (OmU3, Reichert, Austria), and finally stained with uranyl acetate 3% and lead citrate 2% (Peng et al. 2011). The sections were observed by TEM (CM30, Philips). Cell growth inhibition under the effect of ZnO NPs was estimated by calculation of cell growth rate. First, the control and nanoparticle-treated algal samples were loaded into the Neubauer chamber, and cells were counted. where Xi is the cell density at time i and Xj is the cell density at time j.
where μC is the mean value for average specific growth rate in control test vessels and μ is the average specific growth rate for the treatment replicates. To examine the cell viability, algal cells were stained with the fluorescent dye propidium iodide (PI). When excited by blue light, PI can produce red fluorescence in contact with double-stranded nucleic acids, so dead cells with damaged membrane are stained while intact cells remain unstained. Algal cells were washed with PBS (pH = 7.0) and stained with PI (Suman et al. 2015), and the percentage of dead cells in each sample was determined by flow cytometer (BD FACS Calibur, BD Biosciences, San Jose, USA). 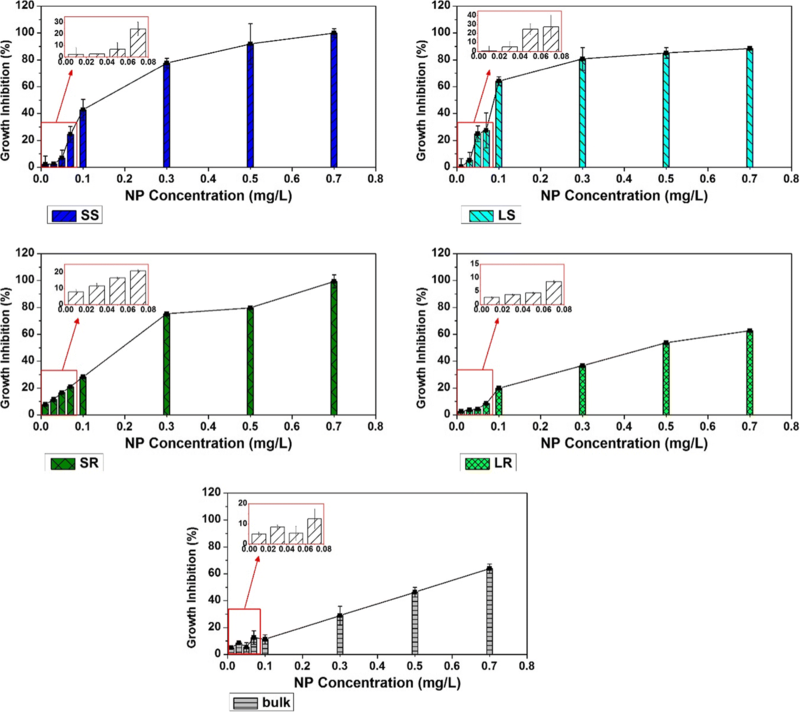 To quantify the intracellular ZnO NPs, elemental Zn analyses were carried out using AAS. At the end of toxicity test duration (t = 96 h), the algal cultures treated with 0.1 and 0.7 mg/L of ZnO NPs were centrifuged at 4000 rpm for 20 min and the supernatant was separated as extracellular ZnO NPs and/or Zn2+. To remove the Zn content bounded to alga cell wall, the pellets were rinsed with 0.02 M EDTA and centrifuged at 4000 rpm for 20 min. The supernatant containing cell-wall-bound Zn was taken, and the algal pellets were acid-digested and used to quantify intracellular Zn. In the figures, the data are presented as mean ± standard deviation. Significant difference between the groups of four nanoparticles was calculated using t test by software Minitab 17. Statistical significance was accepted at a level of p < 0.05. Figure 1 shows the XRD patterns of ZnO structures. Four types of ZnO nanostructures and bulk ZnO exhibited the same XRD pattern, and diffraction peaks were in good agreement with the JCPDS file of hexagonal wurtzite ZnO (JCPDS #36–1451). 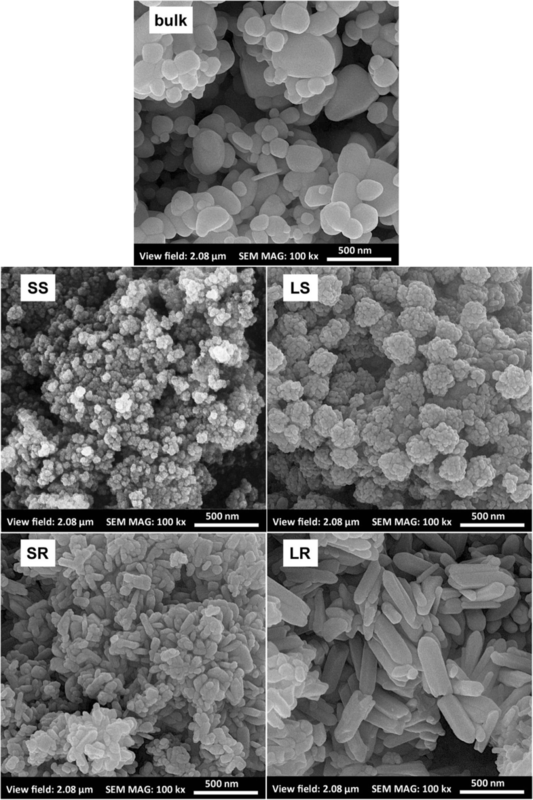 The SEM images of synthesized ZnO nanoparticles are shown in Fig. 2. According to SEM analysis, the average sizes of spherical ZnO NPs were about 20 nm (Fig. 2, SS) and 40 nm (Fig. 2, LS). The diameter of both ZnO nanorods was about 50 nm (Fig. 2, SR and LR), and the lengths were 100 nm (Fig. 2, SR) and 500 nm (Fig. 2, LR). The average size of aggregated particles for bulk ZnO was 160 nm (Fig. 2, bulk). According to DLS data, the particle size in aqueous media was considerably larger. The hydrodynamic diameters for the four ZnO NPs were almost the same. Just after sonication the hydrodynamic diameters were between 400 and 500 nm, but grew larger after 1 day and varied between 500 and 1000 nm. DLS analysis showed only one peak in size for all samples. The dissolution of ZnO structures in AAP medium with the initial concentration of 0.7 mg/L was measured, and the results are represented in Fig. 3. In all cases the dissolution increased slightly after 4 days, but the change of dissolution with time was not statistically significant. The highest dissolution was obtained for SS ZnO NPs, which may be attributed to its higher dissolution rate due to its higher surface area. There was no significant difference between the solubility of other ZnO NPs and bulk ZnO. The solubility of SS was 0.3 ± 0.008 mg/L and for other structures varied between 0.1 and 0.2 mg/L. Bhuvaneshwari et al. (2015) also did not see a significant increase in dissolution with respect to time at concentrations lower than 1 mg/L, and the release of Zn2+ from 1 mg/L of 40–44 nm spherical ZnO NPs after 48 h was 0.2 mg/L. Peng et al. (2011) compared the dissolution of spherical-, rod-, and needle-shaped ZnO NPs and found no relation between the morphology of NPs and their dissolution. The equilibrium solubility was reached after 72 h, which was 4–5% of initial concentration, but they used concentrations higher than 10 mg/L. Lee and An (2013) found the Zn2+ released from 0.3 mg/L of ZnO nanospheres to be 0.03 mg/L at t = 0 and 0.1 mg/L at t = 72 h. Wong et al. (2010) reported that the solubility of nano ZnO in seawater was higher than its bulk form, but similar solubilities were observed in freshwater. Zhang et al. (2016) did not see significant difference between dissolution of bulk and nano ZnO in f/2 medium after 1 day. The dissolutions reported in seawater are usually higher and at concentrations less than 1 mg/L almost 100% (Suman et al. 2015; Miller et al. 2010). Different dissolutions are reported in freshwater based on initial ZnO concentration. At concentrations below 10 mg/L the dissolution is usually about 30% of initial concentration, which is parallel to our results. The addition of ZnO NPs to test medium decreased the cell growth rate while cells in blank samples continued to grow logarithmically and reached the maximum concentration. The growth curve of samples treated with LS ZnO NPs at different concentrations during 96 h is represented in supplementary data (Fig. S1). After exposure to ZnO NPs, morphological changes were observed in algal cells under optical microscope. The morphology of untreated cells was intact and crescent-shaped (Fig. 4a), while morphological changes in NP-treated cells were obvious. Some cells were completely damaged and cell residues were observed (not shown in the figure). Swollen and deformed cells (Fig. 4b–d), and cells losing the chlorophyll content and becoming colorless in some parts (Fig. 4e–g), could be seen in ZnO-treated samples. The TEM image of ZnO-treated algal cells (Fig. 4h) showed that nanoparticles had affected the membrane stability and mild degradation in the cell wall could be observed (Fig. 4h1) compared with normal parts of cell wall (Fig. 4 h2), which is in agreement with the report of Lee and An (2013). Four different kinds of ZnO NPs and a form of bulk ZnO were used in the toxicity tests, and their impacts on cell growth and cell viability were assessed. The growth inhibitions were calculated by comparing the specific growth rates of the ZnO-treated samples with the specific growth rate of the blank sample as described in the experimental part. The inhibition caused by ZnO NPs at different concentrations is shown in Fig. 5. At concentrations higher than 0.1 mg/L, the inhibition changed almost linearly with NP concentration change, except for SR ZnO NPs. The growth was approximately ceased by adding 0.7 mg/L of ZnO NP to the culture medium, excluding LR ZnO NPs and bulk ZnO. Statistical analysis showed that the inhibitions were significantly different when LR ZnO NPs and bulk ZnO were used, and other samples were statistically similar. When the concentration of NPs exceeded 0.3 mg/L, the inhibitions for SS, LS, and SR NPs had the same trend. Considering the lower concentrations, it seems that the inhibitory effect of NPs increases as follows: bulk < LR << SR < SS < LS. In case of LR NPs and bulk ZnO, the inhibitory effect is significantly lower than others. Besides the inhibition in growth rate, NPs may cause cell death in contact with algal cells. To measure the amount of dead cells in each sample, flow cytometric analysis were performed at concentrations higher than 0.1 mg/L and the results are shown in Fig. 6. Rod-shaped NPs reduced the cell viability in a lower degree compared with spherical-shaped NPs. There was no significant difference between cell death in exposure to SS, LS, and SR ZnO NPs, but LR ZnO NPs and bulk ZnO were significantly less destructive to algal cells compared with LS ZnO NPs. By increasing the concentration of LR NPs and bulk ZnO, the percentage of dead cells did not exceed 10%, which is much lower than other ZnO nanostructures. When 0.7 mg/L of LS ZnO NPs was used, the cell death was near 50%. In the measurement of Chlorella sp. viable cells after 24 h contact with nano ZnO at concentrations above 100 μM (8 mg/L), the viability started to decrease in comparison with control (Chen et al. 2012). ZnO NPs also caused cell death in Euglenagracilis euglenoid microalgae (Brayner et al. 2010). In the exposure of Scenedesmus obliquus with nanoparticles of ZnO, the reduction in viability was dose dependent and 1 mg/L of NP could change the viable cells by 24–26% (Bhuvaneshwari et al. 2015). After 72-h exposure to 50 mg/L and 300 mg/L ZnO, 30% and 76% cell death occurred, respectively, in marine Chlorella vulgaris (Suman et al. 2015). Growth inhibition and cell death are both representatives of toxicity. Considering both responses, no significant difference was found between the toxicities of nanospheres with different sizes. Theoretically, smaller particles with higher surface area are more toxic than larger ones. The primary sizes of ZnO nanospheres were different, but when dispersed in culture medium, they reached to similar hydrodynamic diameters. This may be the reason to see the same toxic effect from nanospheres with different initial diameters. This observation was also reported about the antibacterial activity of ZnO nanospheres. Adams et al. (2006) reported that the nominal size for ZnO NPs was different from their real size in the suspension and different sizes showed the same antibacterial effect due to agglomeration and aggregation of NPs which formed a similar size for all particles. 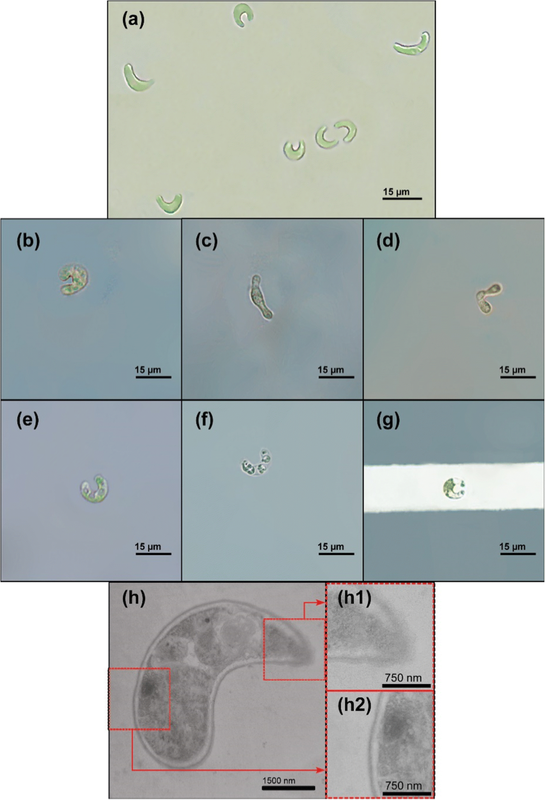 A research on toxicity of ZnO NPs towards freshwater algae Scenedesmus obliquus used two spherical nanoparticles with the same primary diameter but different hydrodynamic diameters and found the smaller ones more toxic (Bhuvaneshwari et al. 2015). Some previous studies on ZnO toxicity reported smaller ZnO spheres more toxic to marine diatoms and nematode (Khare et al. 2011; Peng et al. 2011). A recent work also discussed that particle size affects the toxicity and smaller particles with less aggregation are more toxic (Hou et al. 2018a). The size of nanorod structure was an important factor in the toxicity. When the length of nanorod structure was about 100 nm (SR), the toxicity of ZnO NPs was comparable with nanospheres. When the length increased to 500 nm (LR), the toxicity showed a sharp decrease. The inhibitory effect decreased to half and cell death was also dropped. So when the length of nanorod ZnO structure was large enough, spherical NPs were more toxic. The antibacterial effect of ZnO NPs was reported to be morphology-dependent and spherical forms were more toxic to bacteria than rod-shaped structure (Talebian et al. 2013). In a study on toxicity effect of nanorod and nanosphere ZnO on three marine diatoms, Thalassiosira pseudonana and Chaetoceros gracilis cell growth was completely inhibited by 10 to 80 mg/L of ZnO, but nanorod had more adverse effect on Phaeodactylum tricornutum cell growth (Peng et al. 2011). They concluded that single-dimension nanostructures like nanorods were more toxic and shape of nanostructures has a more dominant effect on toxicity than their size. In the present study, size and morphology together could impact the toxicity. When the size of rod-shaped morphology increased, it appeared to be less toxic compared with spherical morphology. Nano ZnO showed a higher toxicity than bulk ZnO and Zn2+, while bulk ZnO and Zn2+ exhibited similar toxicities. Li et al. (2017) also reported nano ZnO more toxic than bulk ZnO and ZnSO4. When the length of the rod-shaped ZnO NPs grew as large as 500 nm, its toxicity decreased to bulk ZnO toxicity level. The results of toxicity of Zn2+ to algal cells are reported in Fig. 7. The growth inhibition in contact with 0.1 mg/L and 0.3 mg/L of Zn2+ was 6.75 ± 0.9% and 20 ± 1.7%, respectively (Fig. 7a). Increasing Zn2+ concentration to 0.6 mg/L resulted in 65 ± 2.9% growth inhibition. The growth inhibition caused by zinc salt was significantly lower than SS, LS, and SR ZnO NPS, but was not statistically different from LR and bulk ZnO. The percentage of dead cells in contact with Zn2+ (Fig. 7b) was not considering. Adding 0.1 mg/L, 0.3 mg/L, and 0.5 mg/L of ZnSO4 resulted in 1.5 ± 0.09%, 2.1 ± 0.59%, and 5.8 ± 0.67% cell death, respectively, which was significantly lower than SS and LS ZnO NPs. Bhuvaneshwari et al. (2015) observed the cytotoxicity of Zn2+ to be lower than ZnO NPs. In contrast, Zhou et al. (2014) reported Zn2+ more toxic to Chlorella vulgaris than ZnO NPs. When the initial concentration of ZnO NPs was 0.7 mg/L, considering the amounts of Zn2+ released from ZnO structures (Fig. 3) and comparing the growth inhibitions (Fig. 5) and percent of dead cells (Fig. 6) caused by ZnO structures with the growth inhibitions and percent of dead cells caused by equivalent released Zn2+ (Fig. 7), shows that 5% to 20% of the toxicity observed in ZnO NPs may stem from Zn2+. So, the released Zn2+ ions were one of the main but not the only factor in the toxicity of ZnO NPs. Wong et al. (2010) also found that ZnO NP toxicity to marine diatoms was not solely influenced by the release of Zn2+ ions. Lee and An (2013), Franklin et al. (2007), and Aruoja et al. (2009) reported similar toxicities for Zn2+ and ZnO NPs and so related the toxicity of ZnO NPs mainly to the released Zn2+ ion. Chen et al. (2016) also did not see significant difference between the toxicity of ZnO NPs and equivalent released Zn2+ and concluded that dissolved Zn is the dominant factor in ZnO toxicity. Although the dissolution of SS ZnO NPs was higher than other ZnO structures, its toxicity was like LS and SR NPs. Bulk ZnO and LR NP dissolutions were similar to LS and SR, despite their lower toxicity effect. In addition, the role of toxicity of Zn2+ was less than 25% of total observed toxicity in ZnO NPs. These all show that the difference between the toxicity of various morphologies of nano ZnO cannot be ascribed to Zn2+, and the NPs themselves with diverse structures were playing a more important role in the whole toxicity. It should be mentioned that since the dissolution of ZnO NPs in the “Dissolution of ZnO NPs” section were performed without ultrafiltration, dissolution values (Fig. 3) may be overmeasured, and so, the role of NPs in toxicity may even be higher. Figure 8 represents the intracellular Zn content after 96-h exposure to 0.1 mg/L and 0.7 mg/L of ZnO samples. Due to different inhibitory effects of NPs on algal cell growth which led to different algal biomass at the end of the toxicity tests, the intracellular Zn content is reported as the amount of Zn per cell. To omit the Zn not coming from ZnO NPs, the amount of Zn inside untreated alga cells was quantified in blank tests. The percentage of ZnO NP that could enter the cells varied between 1.9 and 8.4%. In both 0.1 and 0.7 mg/L of initial ZnO concentrations, SS ZnO NP internalization per cell was more than other ZnO structures. No significant difference was found between intracellular Zn content of samples. It can be concluded that Zn could slightly cross the cell wall and enter the cells (either in form of ZnO NP or Zn2+), but the negligible amount of intracellular Zn was not the main factor controlling the toxicity since no difference was observed between intracellular Zn content of samples. Bhuvaneshwari et al. (2015) reported that 0.7% and 14% of ZnO NPs with average particle size of about 100 nm and 40 nm entered the cell, respectively. Zhou et al. (2014) obtained the amount of Zn inside C. vulgaris cells, 4.11–14.6 μg/L in contact with ZnO NPs (5 μmol/L, 10 μmol/L, and 20 μmol/L). Zhang et al. (2016) reported the Zn inside marine algae 10−9 mg/cell for the blank test and 598.2 × 10−9 mg/cell for cells exposed to 10 mg/L ZnO. They found that internal Zn content of cells in contact with ZnO NPs was more than those in contact with bulk ZnO and concluded that intracellular Zn was a dominant factor to explain the toxic mechanism of nano ZnO. This work focused on assessment of toxicity of nano ZnO on green algae R. subcapitata. ZnO NPs were more toxic than bulk ZnO and Zn2+. The effect of nanoparticle size and shape was investigated on algal growth inhibition and cell viability. The results showed that for spherical nanoparticles, although the primary sizes of nanoparticles were different, their hydrodynamic diameters in algal culture were almost the same and similar toxicities were observed. Nanorod structures with smaller primary size had greater inhibitory effect than larger nanorods. Increasing the size of rod-shaped ZnO nanostructures made them less destructive to algal cells compared with nanospheres. The results showed that size and morphology may together impact on toxicity; therefore, some nanostructures may be regarded as safer forms and at priority to be used in industrial products. The difference in toxicities could not solely be attributed to dissolved ZnO (Zn2+), and ZnO in form of NP was also an important factor. Further investigations on the toxicity of nanoparticles with different structures may result in a useful direction for the manufacturers to choose, when it is possible, the nanostructures which are less harmful to ecosystems. The results were extracted from the PhD thesis of Mahya Samei (Faculty of Chemical Engineering, University of Tehran, Tehran, Iran). This study was financially supported by grants from University of Tehran and Tehran University of Medical Sciences, Tehran, Iran.